Toronto is in first place. Toronto is no longer in first place. P.K. Subban will be ushering in 2016 in style, literally, and for a good cause. The Montreal Canadiens' star defenceman will be wearing personalized skates against the Boston Bruins for the Winter Classic on Jan. 1 at Gillete Stadium in Foxborough, Mass. Subban, who had an interest in sketching as a child, has teamed with former Bruins legendary defenceman Ray Bourque and will raffle off tickets for the skates to raise money for P.K. 's Helping Hand, a fund dedicated to assisting vulnerable families financially devastated by a child's illness. 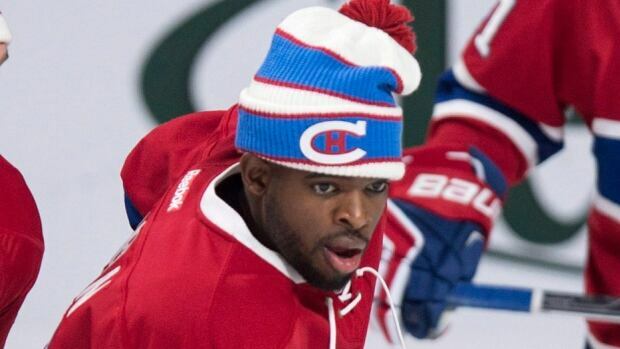 Subban, who estimates eight pairs will be made at the CCM-Reebok factory in St. Jean, Que., has his No. 76 on the side of the skates while the pump above sports the No. 4 for late Canadiens great Jean Beliveau, who had a great impact on Subban's life and dedicated his life after hockey to helping children. Leaf fans always dream of September when the Leafs stand in 1st place for the only time during the year. Also April for the fans who enjoy watching which club the players use coming up the back 9. Doesn't look like any Canadian teams will make the playoffs. Go Rangers. You mean I bought tickets to the Leaf's Stanley Cup Parade for nothing? Election 2016 - because it's NEVER too early!